What did I feel when I first went into the rehearsal room?  I was in the Royal Exchange Theatre, for goodness sake - a theatre I have been going to for years and where I’ve seen some amazing plays and now here I was being introduced to Elizabeth Freestone and Jeanie O’Hare, the director and writer of Queen Margaret, respectively. I needn’t have worried, though, because they both made me feel more than welcome. 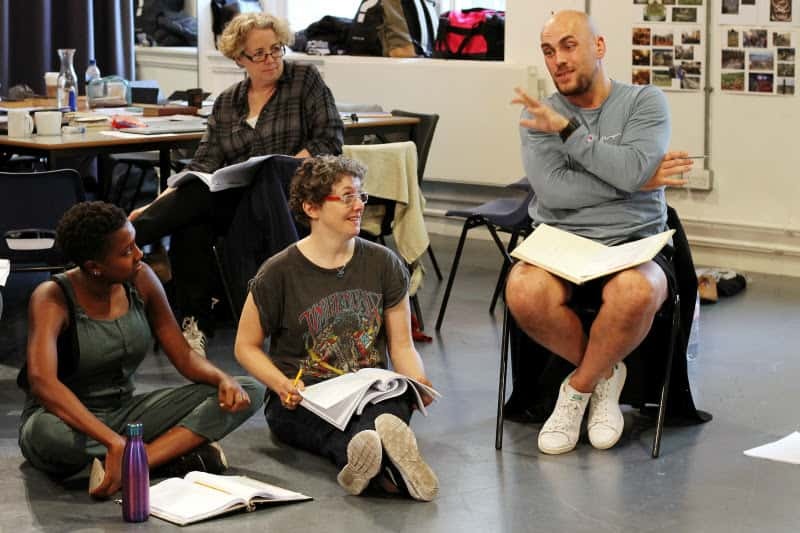 The mood in the rehearsal room was upbeat and there was a lot of laughter but this did not detract from the strong sense of a group of people with a job they were raring to get their teeth into. After brief introductions to the cast, I sat down to start my first observation (though I must admit that although I sat with pen and paper at the ready to record my fascinating insights, I found myself constantly drawn into what was happening around the large table and in the space and forgot to make notes for whole chunks of time). I’ve never written a blog before, but here are some of the questions I’ve asked myself; I hope you enjoy finding the answers with me. HOW DO YOU CREATE AN EMBSEMBLE? It strikes me that the first job of any director at the start of the rehearsal process is to build a sense of unity among their actors, a feeling of mutual trust and common purpose. This play has a large cast: 11 actors, some of whom play more than one role. Some of them may have worked together before, they may be aware of each other’s previous work, or they may be complete strangers. Either way, without an ensemble, there’s a risk that the actors will not be invested enough in the piece to create a convincing on-stage world for the audience, so they need to get to know each other: quickly. Making the process as democratic as possible is a sure-fire way of making everyone in the room feel that they can contribute freely and that everyone’s ideas are valid. I was struck by how much Elizabeth listened to her actors: she listened far more than she spoke. She seemed able to ask a brief question about a scene and then let the responses come back, always encouraging and accepting. It was impressive to see just how many responses the cast could generate and this showed me that in a very short time, the group had come together. The focus of the first week’s rehearsals was ‘creating the world of the play’. Queen Margaret is a play about people and events from the Middle Ages, full of historical detail which the cast have got to become very familiar with. For this, Elizabeth asked the cast to read through the scene fairly quickly round the table, then extract factual detail and invite questions; the actors took turns at writing this down. 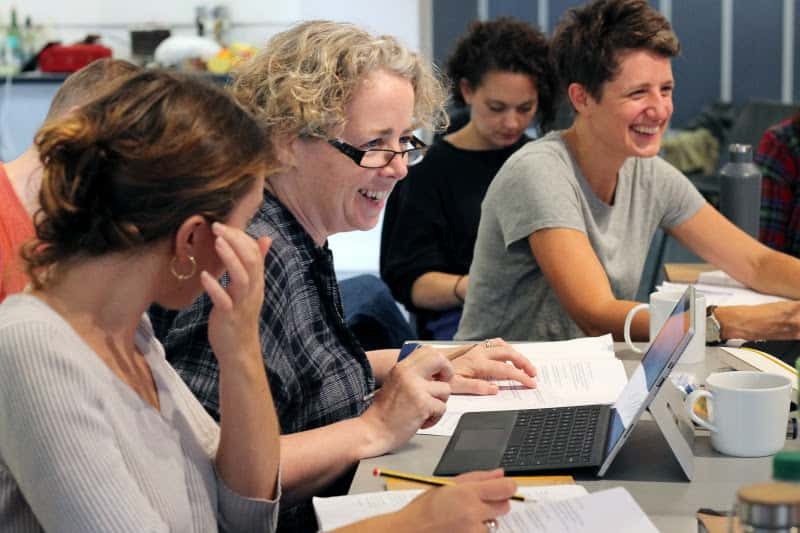 Again, I was struck by the way Elizabeth spoke softly, listened attentively and thus created a very collaborative atmosphere around the table, encouraging the actors to see connections and probe the text further and arrive at a range of possible meanings. There was no ‘right’ answer which again created a sense of shared understanding. When the same scene was then improvised, the actors naturally felt secure in their understanding of the scene and were then able to ‘play’ with it. Very interestingly, the actors first built the world of the scene using bits of props and other objects to suggest a bedroom, a country road or a room in a palace, which also gave them the confidence to move around the space playfully and intuitively. I felt very privileged to see some fantastic insights and discoveries emerging from these improvisations. Again, I was struck by Elizabeth’s low-key approach. She really gave the actors their freedom, only occasionally gesturing for someone to increase the intensity of an emotion or to move to a particular place. The final part in this collaborative approach was the debrief, still in the space which the cast had created, where further questions could be asked and insights shared. Often, actors had made new discoveries about their character, other characters or the scene in general. HOW DOES THE WRITER FEEL WHEN HER PLAY IS FIRST PUT ON ITS FEET BY THE CAST? I wasn’t actually able to put this question to Jeanie O’Hare, but I could see that it was a huge benefit for the actors to have the writer present. They were able to ask her directly about a number of things, although again, there was the sense of collaboration and a degree of negotiation and on Thursday, there were a number of script revisions which had arisen from previous rehearsals. I finished the week with the feeling that in this very short time, the ensemble had been created and that everyone involved was passionate about bringing this story to life: a story which they all believed in and believed will touch the audience through the play’s intrinsic contemporary relevance. Unfortunately, I can’t observe in week 2, but I’ll try to make up for lost time in subsequent weeks. I know things will have moved on a lot when I’m back in the room and I can’t wait to tell you all about it.